Photo: Kate Holt/IRIN. Man and beast: Cows are central to the economy and social fabric of South Sudan. KAMPALA, 15 January 2015 (IRIN) - At 11 million head, cattle outnumber people in South Sudan and are central to the country’s economy and society. Now, 13 months of civil war have disrupted traditional migration routes and disease patterns in a way that has sparked fresh cycles of violence and jeopardized the country's broader social cohesion. South Sudan’s cattle are in danger of becoming “no longer resilient, no longer economically viable, not a viable way of life,” Sue Lautze, country head of the Food and Agriculture Organization, told IRIN. Twenty-five-year-old pastoralist John Mabil, who also works as a teacher, is already bearing the impact. “Right now, I am doomed,” he said from Juba. His journey began from his home in Bor, capital of Jonglei state. Conflict forced him to flee first to neigbouring Lakes State, then to Juba, and then to Kakuma, a refugee camp in northern Kenya. In the camp, he hatched a plan: he would sell a handful of his 25 cattle to pay for a university education in Uganda. Armed with the degree, he would return to a better job in a peaceful South Sudan and use his remaining cows as a down payment on a dowry. He would marry, start a family and, in time, forget the war. Back in Juba in January, Mabil got a call from his father, who tends his cattle. Eleven were dead. Several more have since fallen sick and will likely die. There will be no university education, Mabil said. All his plans were shot. From the symptoms he described – bloody diarrhea, loss of appetite – the cattle probably succumbed to the tick-borne East Coast Fever. The disease is prevalent in the area of southeastern South Sudan where Mabil’s father had taken the animals to graze. He knew the risk of infection and would normally never have driven the animals that far south, but it was the only place he felt they were safe from the war. 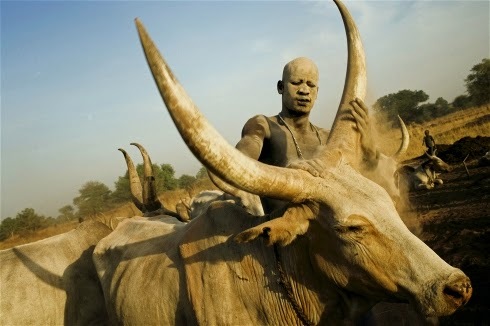 FAO estimates that at least 80 percent of South Sudan’s population relies on cattle to some degree. For many groups – adolescents, lactating mothers, herders – it is their main source of nutrition. They are also “the primary bankable asset for most South Sudanese people,” said Lindsay Hamsik, a spokesperson for the non-profit group Mercy Corps, which specializes in long-term recovery. That means that if a family member falls ill or food runs short, a cow is sold off to buy medicine or new supplies. Though the UN and NGOs assist, South Sudan’s government – well aware of the social and economic primacy of cattle – has traditionally taken the lead on animal health and protection. The army and police are deployed during the country’s dry season to deter cattle raids and community-based animal health workers assist with vaccinations. But now conflict has taken precedence over the animals. The government has shifted resources from caring for livestock to the war effort, according to Lautze. The current national budget allocates around $130 million to be split between all natural resources activities – livestock projects, but also emergency food security and the salaries of Wildlife Service officers. In comparison, the security budget is more than $1.3 billion. Lautze said the Ministry of Animal Resources, home to her main government partners, has not had electricity since well before Christmas. Meanwhile, humanitarians lack the resources to offset all of the cutbacks. The effects are already evident. There is an immediate risk of violence, both from cattle raiding and between farmers and herders competing for the same land. Moreover, “the areas where these herds have relocated have witnessed intensive and continuous movements of livestock concentrated in small areas. The arrival of large numbers of livestock … has challenged the local power structures, squeezed natural resource availability, and altered disease patterns.” That in turn is leading to confrontation. Mabil’s father, for instance, faced threats as he drove cows through farming land in the country’s southeast. Agriculturalists “are becoming unfriendly,” Mabil said, angered by the destruction the cattle are wreaking on their crops. “They killed some cows and when we asked them why, they started to fight,” he said. There are few officials available to mediate these conflicts or security officers to offer protection. And then there are the diseases. East Coast Fever, but also Foot and Mouth Disease, which can spoil milk production, and trypanosomiasis, which is transmitted by tsetse flies and can cause wasting and ultimately death. In the midst of the fighting, it is impossible to keep statistics on livestock morbidity and mortality, Lautze said, but the anecdotal reports are enough to raise an alarm. Earlier this month, one community lost 8,000 cattle to liver flukes – a parasite that is easily treatable in normal circumstances. “This isn’t a problem we should have,” she said. As with most crises, South Sudan’s poorest families are being hit hardest, Mercy Corps’ Hamsik said. “Shocks are going to have larger affects on smaller herds. Smaller herds are typically carried by more food-insecure households,” she said. A shock isn’t even necessarily a death. An individual cow’s illness is enough to spell economic ruin for some families. There is the immediate loss of milk as a source of nutrition for the household, but it also becomes less likely the cow will reproduce and its trade value wanes. The scale of the current crisis is now well beyond the individual household level, though, with the potential to sink entire communities. Shrinking collateral is making it more difficult for traders to secure goods, especially where fighting has disrupted normal trade routes and sent prices skyrocketing. There is a risk that markets, which would normally subsidize a community’s harvest and get people – including farmers or merchants – through the lean season, could dry up. Many markets in the areas most affected by the conflict are already struggling. That could be catastrophic, especially to the 2.5 million people international experts predict will be suffering from severe food insecurity by March of this year. And then there are the long-term implications. “Any kind of crisis with cattle isn’t merely a crisis that will have an effect on food security,” Hamsik said. It has put marriages and educations on hold and will make it more difficult for people to emerge from poverty. The FAO is already hurriedly trying to patch together an immunization system to combat some of the emerging diseases, beginning with the delivery of solar-powered refrigerators to store vaccines until they can be injected. But the organization is starting virtually from scratch.